Have I mentioned lately how much I adore my friends and readers? You all are absolutely amazing! And you’ve really shown up on Facebook, as my page has surpassed 5,000 Likes. WOWZA! Have I also mentioned all of the spectacular authors I am blessed to know? I mean, authors are just incredible people, especially the indie world. And they’ve proven it once again by contributing over 60 books for a very special (and GINORMOUS, as Dorian would say) giveaway. It’s the 5K Giveaway! To the 5,000+ people who think I have something worth “liking,” you’re kinda crazy, but I love ya hard! To show my thanks for all of your support (because I wouldn’t be here without YOU! 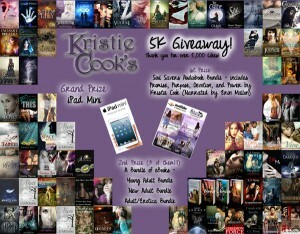 ), I’m doing this amazingly fabulous giveaway! Over 60 ebooks from some seriously awesomesauce authors. Please be sure to thank them for their contributions (and check out their books while you’re at it *grin*). Open internationally. Giveaway ends midnight ET, Sept. 30th. Winners will be announced the first week of October. 4 Responses to 5K Giveaway! I have just recently read your first four books now just need to read Power and Wrath…omg i can’t wait to read these because if they are like the others then i am in for a fabulous read!! As for your massive give-away…this is so generous of you and i would love the chance to win, thank you!! I love your books. Promise first caught my with the pretty lilly on the cover way back when, and I’ve been hooked ever since. Anyone I recomend the series to (and there have been quite a few) are hooked. So thank you so very much for the hours of entertainment you’ve brought us. Can’t wait to find out how us norms are going to deal. I’m sorry I’m not on face book so won’t be able to enter the latest give-away, but it is so awsome that you love your readers that much. Thank you for allowing us the opportunity to read such rich characters! I love the development of your characters Alexis and Tristan. Through your writing I have laughed, cried, and then laughed some more! Thank you as there are very few writers with your talent to pull the reader into the story as if we are right there with the characters through it all! I absolutely love your new series “The Space Between” and I can’t wait to see what will happen next! I am on disability and constantly looking for ways to ” zen” or “go to your happy place”. I found that with you I am 60 years old and have devoured your books. I am happy when I can just find a spot and read. I am reading your series with Alexis and Tristan. Thank you for my “zen and happy place”. I look forward to all the books you write. I am in the story at all times so that should tell you how good you are at involving your reader. I found you on KOBO and it enables me to read again with my eyesight failing.